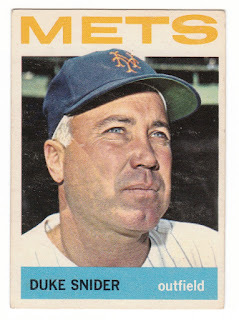 While Duke Snider will be forever associated with the Brooklyn Dodgers, "Boys of Summer," Snider returned to New York in a homecoming of sorts when he was purchased by the New York Mets in 1963 from the Los Angeles Dodgers. Well past the peak of his career, Snider batted .243 with 14 home runs in 129 games for the Mets who were only in their second year of existence. One of Snider's most memorable moments in his only season with the Mets came during a June 7th, 1963 game against the St. Louis Cardinals at the Polo Grounds. Digging in with two men on in the bottom of the 9th inning against reliever Diomedes Olivo, Snider crushed his offering into the second deck for a three-run walk-off homer. Snider's magical Mets moment was recently published from the Major League Baseball vaults for everyone to relive. Take a few seconds to watch the sweet swing that produced 407 major league home runs.